In today's ritual worship of a Buddhist scripture performed in Kwa Baha or the Golden Temple in Patan, Nepal, a Vajracarya priest invokes the goddess Prajnaparamita to come into a book (fig. 1.1). The contemporary ritual that takes place around a treasured, thirteenth-century black-paper manuscript of the Astasahasrika Prajnaparamita sutra [Perfection of Wisdom in eight thousand verses, henceforth, AsP] may not date back to the inception of the Buddhist book-cult in the early centuries of our common era.1 But it reveals an intriguing issue regarding the relationship between the goddess and the book. 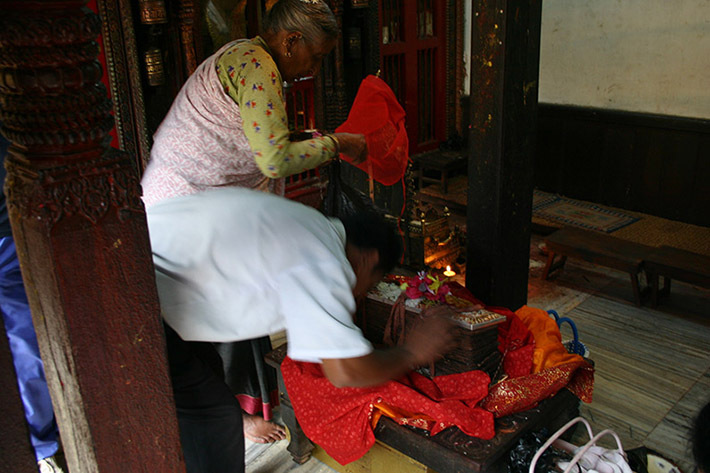 In this twentieth-century version of pustaka puja, or the ritual worship of the book, the book serves as a vessel for the goddess to come in and it becomes an icon of the deity throughout the ritual. There is almost a promiscuous absence of the goddess Prajnaparamita, the personification of the famed Mahayana philosophical text of the same name. Of course, her presence is clearly palpable through the sound of the text recited loudly and through physical communications that occur between her and her devotees. It is her form that is absent in this ritual. As a personification of the perfected (paramita) wisdom (prajna) which embodies the profound Mahayana concept of emptiness (sunyata), perhaps the absence of her visual manifestation itself represents her presence. But why is there a book in worship instead of an image of the goddess? How can a book replace a goddess when the possibility of "darsan (the divine grace through mutual gaze or seeing the divine)"2, the most quintessential aspect of devotional practices in Indic religions, practically disappears with this replacement? We will seek answers to these questions in subsequent chapters by exploring the history of illustrated Buddhist manuscripts in India. We will examine how a medieval Buddhist book was constructed as a sacred object and how its sacrality was intensified through various iconographic means and ritual interventions. Before entering the world of medieval Indian Buddhist manuscripts, understanding the historical process in which certain types of books emerged as the foremost sacred objects for Mahayana Buddhists will guide us to address this study's central theme, the significance of a book as a material object. In this chapter, we will first examine how Buddhist books were used in ritual context historically and consider the nature of the Buddhist book-cult in practice. As written, material records of the Buddha's teachings, books were important doctrinal assets for the Indian Buddhist traditions, especially for Mahayana Buddhists. In addition to the passages in the sutras and vinayas, we could glance at how some of the surviving manuscripts might have been used in cultic context in ancient and medieval India by examining the visual evidence that depicts books in ritual use. Scholastic use of manuscripts is easily attested from as early as second-third century in a Gandharan relief where we see monks holding a manuscript in their hands and discussing the contents. It is in the Buddhist caves of Ellora excavated during the seventh century where we find one of the earliest surviving visual evidence for cultic use of a manuscript. Here we see a manuscript being used to invoke a goddess, paralleling the contemporary Nepalese practice mentioned above. Upon entering the antechamber of Cave 6 at Ellora, we meet two impressive standing goddesses, Mahamayuri and Bhrikuti, flanking either end of the room. 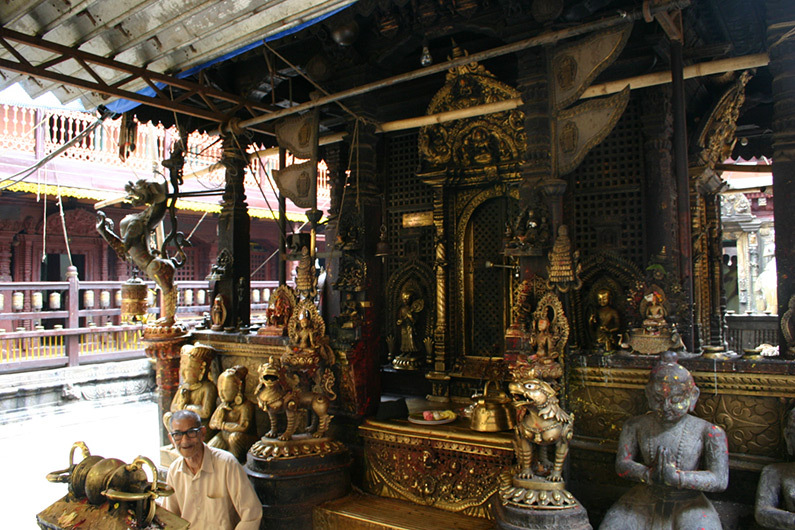 Mahamayuri is clearly identifiable, thanks to the presence of a peacock (mayur) with his fanned trains on the mid-left section, right next to the goddess.3 Below the peacock sits a monk on a bench to the lower left corner. His shaven head and red monk's robe covering only the left shoulder bears out his monastic identity (fig.1.2). He is seated with a narrow cross-legged table in front. 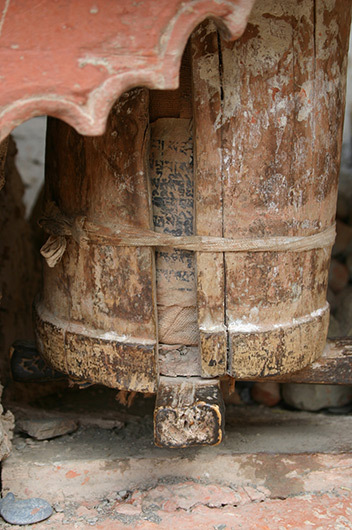 On top of this table lies a book, a long narrow rectangular object, represented in a typical "pothi" format of birch bark and palm-leaf manuscripts. This is most likely a manuscript of the Mahamayuri sutra. What is a monk doing with a manuscript at the feet of a goddess? With his head tilted slightly downwards, the monk appears almost indifferent to the presence of the glamorous goddess. His mind is focused on the book in front of him. It is difficult to make out what he holds in his hands. It could be either an offering to the book as he worships the sutra, or a folio of the book that he lifted up from the stack in front of him while reciting it to invoke the goddess. The book on the table is visually and physically connected to the goddess as one end of the book extends to the back and meets the end of her robe draped from her raised right arm. It is as if she has been generated from the book. As Mevissen speaks of this panel, "the monk, by virtue of his imaginative powers causes the divine energy of the text, ..., to appear in his mind's eye and materialize before him in an anthropomorphic form. "4 This panel seems to represent a process of transformation from a text to a goddess through a monk as a mediator. A simple ritual of beholding and reading a book with no elaborate ritual implement is so efficacious as to invoke an impressive protector goddess. The devotees can easily follow the monk's activity as an exemplary model when they need the mercy of Mahamayuri's presence. Although there is no textual instruction accompanying the panel, the visual message seems quite clear: "to invoke the goddess Mahamayuri, one should worship and/or recite a book of the Mahamayuri sutra." The panel establishes an interesting semiotic relationship between the book and the goddess. The goddess may be a symbol of the book, but it could be vice versa. Both the book and the goddess are, in fact, signs of the text, the Mahamayuri sutra, one indexical and the other symbolic, if we are to employ Piercean terms. The Mahamayuri sutra is an apotropaic text in which the Buddha explains the power of Mahamayuri against various disasters, including snake bites. Amoghavajra's Chinese translation of the Mahamayuri sutra, Fo-mu-da-kong-qiao-ming-wang-jing, which dates to the eighth century, begins with the story of a bhiksu named Svati (??) who was stung by a poisonous black snake. The snake bit his right foot and the venom quickly spread through his body. Ananda saw Svati in great pain and reported the situation to the Buddha and asked what was to be done. Hearing this, the Buddha mentions the great power of the Mahamayuri-buddhamatrika-vidyarajni dharani (lit. Great dharai of Mahamayuri, the Buddha mother-wisdom queen5), which destroys all sorts of poison, fear, calamity and anguish. He instructs Ananda to protect Svati from calamity using this dharani.6 While the Chinese translation makes it clear that the text concerns the power of a dharai, in a later Sanskrit manuscript made in the eleventh century, the text is more ambiguous about what is signified in the epithet, "mahamayuri vidyarajni" because the word "dharai" is omitted in the Buddha's instruction to save poor Svati with this powerful tool. 7 The context makes it clear that it denotes the dharai, but the term, "mahamayuri-vidyarajni" could also be an epithet of the goddess Mahamayuri as well as that of the entire text of the Mahamayuri sutra. 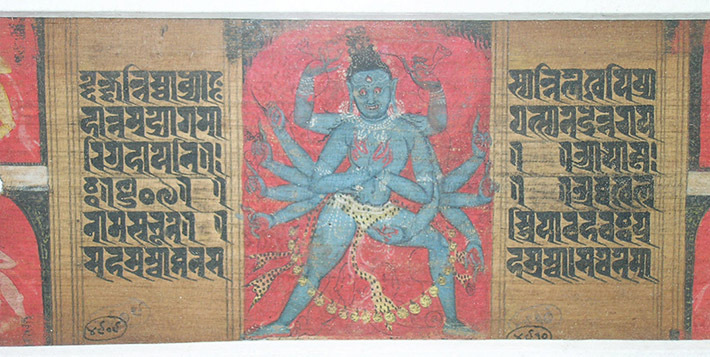 Later in eastern India and Nepal, Mahamayuri was subsumed into a group of five protective goddesses, called Pancaraka, and all five goddesses are symbols of the texts that they are supposed to personify.8 In the context of the Pancaraka cult, which eventually developed within the frame of the Buddhist book-cult, the goddess is the text, and the book becomes a container of both the goddess and the text.9 But this interpretation is not applicable yet in Cave 6 at Ellora. Here the book still remains a sign of the text, and the book and the goddess retain a more or less parallel semiotic relationship to the text. If the nature of the monk's activity was not entirely clear in Cave 6, the Mahamayuri panel in Cave 10, completed a few decades later, makes it clear that he is reading, or perhaps reciting, a book (web.1-1). The panel is smaller in scale, and it is not as glamorous in its presentation. The body of the goddess also appears more robust in style. But the basic iconographic scheme remains the same. Mahamayuri is standing in the middle, with a strutting peacock in the mid-left section. The monk squats in the lower left corner, and it is clear that he is holding a manuscript in his two hands with his eyes downcast, as if reading carefully from the text. 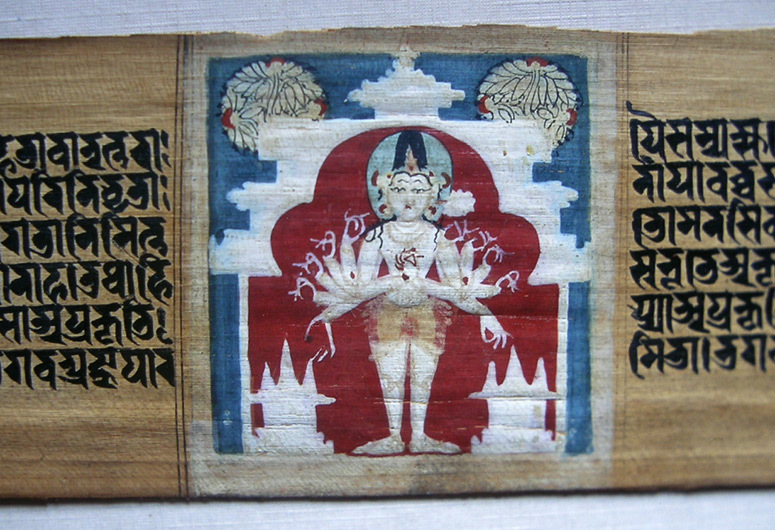 One end of a long pothi manuscript hangs low from his right hand over the rectangular object underneath. This rectangular object may be a bookcase that sits on a simple cross-legged bookstand. Our monk is probably reciting the sutra as his mouth seems slightly open as a small gap in between his lips suggest. The efficacy of a dharai, and any mantra, is in sound. Given that surviving Sanskrit Buddhist manuscripts are written in "scriptura continua" which would have made "silent reading" quite difficult, it is only sensible to assume that these texts were recited and vocalized.10 This panel, then, also suggests to us that Indian Buddhist monastic establishments were probably not as quiet as one might imagine, with many monks and novices reciting and reading out loud different texts simultaneously. According to this panel, the ritual of using a book for a cultic purpose required only two essential elements: a special book on a bookstand to recite from and a reciter with an ability to read the text. Emergence of a book as a special object of worship is closely tied to the renewed popularity of the Prajnaparamita sutra-s in medieval India. The Prajnaparamita literature deals with the most fundamental Mahayana Buddhist philosophy for many Mahayana Buddhist schools.11 But was this text a super hit from the time when it originally appeared in the beginning of our Common Era? It had an enormous impact on the philosophical development of Mahayana Buddhist schools and had enthusiasts, but it seems to have attained "no great cult", at least not until the ninth century.12 The later, received status of the text contributed to its legendary historical importance in our understanding. The composition of the Prajnaparamita text has been dated to the early centuries of the Common Era, largely based on the dates of Chinese translations.13 The earliest Chinese translation of the Prajnaparamita literature was the translation of the AsP, the Prajnaparamita in eight thousand verses, done in 179-80CE by Lokaksema (T220).14 The AsP seems to have enjoyed a privileged status as a favored text of scholastic Buddhism from early on: it was translated into Chinese six times beginning with Lokaksema's translation and ending with Danapala's translation in 985 CE. However, the earlier Chinese translations do not exactly match the surviving Sanskrit manuscripts of the AsP, most of which date from the eleventh and the twelfth centuries.15 The fact that the AsP was translated six times in eight hundred years not only reflects the enthusiasm over this text but also suggests the possibility that this text may have evolved and changed in India reflecting the changes in Buddhist doctrine and practice.16 When compared to the Chinese translations, the extant Sanskrit form of the AsP corresponds loosely to Danapala's translation, with later interpolated sections that could have been included after the seventh century, and well into the Pala period (ca. 8th-12th century) when the Pala kings ruled in the area of the modern day Bihar and West Bengal. Taranatha's account is to be read with caution because, as a sixteenth century Tibetan scholar, he tends to idealize the North-East Indian Buddhist world with nostalgic notions that lack accuracy. His historical details are not trustworthy, but this passage suggests that the Prajnaparamita texts (re)surfaced as one of the two primary doctrinal principles, paralleling the clearly esoteric teachings of the Guhyasamaja in the early ninth century. Taranatha also records that there was a belief at his time that Dharmapala was a reincarnation of a master of the pitaka who was reborn for the purpose of propagating the Prajnaparamita.18 According to our Tibetan source, the Prajnaparamita sutra needed an official, royal boost in the ninth century to restart the support system. A revival of the doctrinal interest in the Prajnaparamita texts may also be seen from the dates of the major commentators of the AsP. One of the two major commentators, Haribhadra (the Abhisamayalamkara), was active during the reign of King Dharmapala at the beginning of the ninth century, while Abhayakaragupta, a famed scholar of the Vikramasila monastery, was active during the reign of King Ramapala at the beginning of the twelfth century. The cult of Prajnaparamita was already in practice earlier in the fifth century, as reported by the Chinese pilgrim, Faxian (ca. 377-422CE), but it is difficult to ascertain what the focus of this cultic practice was, whether it was the goddess or the book. Faxian reports that he saw that Mahayanists worship the Prajnaparamita in a monastery he visited in Madhyadesa, somewhere between Mathura and Samkasya. This reference has been taken as evidence for the existence of the goddess Prajnaparamita in the fifth century, but what Faxian meant by "Prajnaparamita" is not clear: It could mean a book of the Prajnaparamita sutra or an image of the goddess Prajnaparamita. This passage indicates that the Prajnaparamita cult was established as a specifically Mahayana practice. Faxian reports Mahayanists worshipped Prajnaparamita, Manjusri, and Avalokitesvara, in comparison to other groups worshiping other objects, namely texts: Vinaya masters worshipped the Vinaya and Abhidharma masters the Abhidharma. Contrary to the popular perception that identifies Prajnaparamita as a quintessential Buddhist mother goddess19, Prajnaparamita's goddess identity seems to emerge much later than the appearance of the Prajnaparamita text. Western scholarly understanding of Prajnaparamita as a Buddhist mother goddess originates from the analogies in the AsP text where the Buddha compares the relationship between Prajnaparamita and Buddhas to that of a mother and her children. But these references are metaphorical analogies that emphasize the importance of "Prajnaparamita" in achieving enlightenment.20 Her qualities in these passages do not fit the general conception of a mother goddess with a loving, nurturing, and sometimes wrathful character. For example, the AsP explains how the "Prajnaparamita" should be treated and respected like their mother by all the Buddhas because it is from her that enlightenment originates. Yet there is no mention about what she can do for her spiritual sons. If Prajnaparamita had ever been a mother figure, it would have been a very remote and reserved one. 21 Such a simile played a role in determining Prajnaparamita's anthropomorphic form as a goddess (fig.1.3). In a twelfth century manuscript painting from Nalanda, a voluptuous goddess bedecked with ornaments sits in vajraparyanka (cross legged posture) displaying the gesture of preaching. She is regal and serene symbolizing the perfection of wisdom, the foremost requirement for one's enlightenment. The mother analogy in the AsP comes to the forefront in understanding and representing the goddess Prajnaparamita with the development of Esoteric Buddhism in India in which the female principles became important for one's spiritual success.22 Surviving epigraphic and art historical evidence suggests that Prajnaparamita's identity as the mother of all Buddhas was established by the eleventh century.23 The fact that only the late tenth century Chinese translation of the AsP (T228) by Danapala in 985CE uses the term Fo-mu or "Buddha mother" in its title (Fo-shuo-fo-mu-chu-sheng-san-fa-zang-ban-ruo-bo-luo-mi-duo-jing) also suggests this. Once the images of the goddess Prajnaparamita appear in the scene, we might expect to see her becoming the main focus of the Prajnaparamita cult. Yet, we do not find a dramatic shift of the cultic focus: most of the surviving images of the goddess found in Nalanda and in other eastern Indian monastic sites are made of bronze and relatively small, with their heights less than ten inches, most of which were made for personal devotional practices. Instead, we see the explosion of Buddhist book production, especially of the illustrated manuscripts of the Prajnaparamita, from the late tenth century, in the monastic sites in the ancient regions of Magadha, Gauda and Varendra (modern Bihar, West Bengal and Bangladesh). 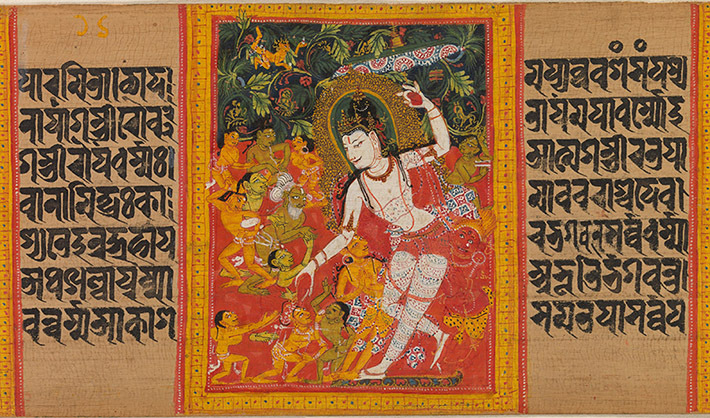 The goddess Prajnaparamita is featured prominently as a beautifully bejeweled voluptuous goddess in these manuscripts, marking the opening of the text and serving as a symbol of the entire manuscript (fig.1.3). But the object that actually garnered devotion and worship was probably the book, not the goddess. The goddess Prajnaparamita did not seem to have earned much cultic importance in Bihar and Bengal, especially after the booming of illustrated manuscript production there. Interestingly, in nearby Orissa where we do not find any surviving Buddhist manuscripts from the period, the goddess Prajnaparamita seems to have emerged as an important cultic deity, as exemplified by a number of stone images of considerable sizes (measuring between 30 to 65 inches in height) made in the eleventh century or later, some of which are still in worship.24 Although no Orissan Buddhist book survives, a book in worship is commonly included in these representations of the goddess. One such image, an eleventh-century image of the goddess Prajnaparamita from Orissa, contains a full-pledged ritual worship of a book. The image was found in Mangalpur (Puri), Orissa, and is currently installed in the Orissa state museum in Bhubaneshwar (fig.1.4). It is a rectangular stele made of sandstone, a common format and medium used in early medieval sculptures from Orissa. The size of the image is considerably large, measuring 128cm by 65cm (with 31 cm in depth). It probably dates to the later half of the eleventh century.25 A two-armed female deity sits in the center with her legs crossed (vajraparyaka-asana). Her two arms are broken, but the remaining parts suggest that she held her hands in front of her chest in the preaching gesture (dharmacakrapravartana mudra). She wears many ornaments, including a tall, bejeweled crown with ribbon flying upwards on either side. Her shawls also fly upward from her arms, as if indicating her buoyancy. The trace of vermillion powder on her forehead and crown suggests that she was in worship as a cultic object before coming to the museum. She probably remained in worship as a local goddess even after the demise of Buddhist institutions in the region, partly because of her impressive size and sculptural quality.26 Despite some extensive damage to the surface, it is possible to see the gracious yet commanding presence conveyed in the image. The composition of the stele is quite busy with many figures appearing in the background. Five tathagatas with Amitabha in the center appear along the trefoil shaped halo of the goddess, and four human figures stand offering garlands in between these five Buddhas. Two celestial beings also offer garlands flying amidst clouds on the either side of the very top of the stele. Two more human figures, most likely monks, appear on either side of her legs, looking upwards reverently. Below her double lotus seat appears saptaratna (seven jewels of the universal monarch, cakravartin, i.e. wheel (cakra), wish-granting jewel, sword (i.e. general), treasurer, queen, elephant, horse), each element appearing in the middle of a vine. 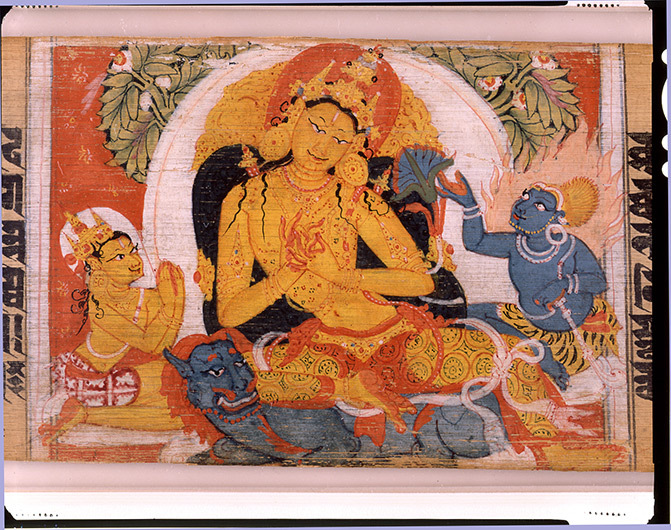 Although the image is identified as Tara in the museum label, it represents the goddess Prajnaparamita. 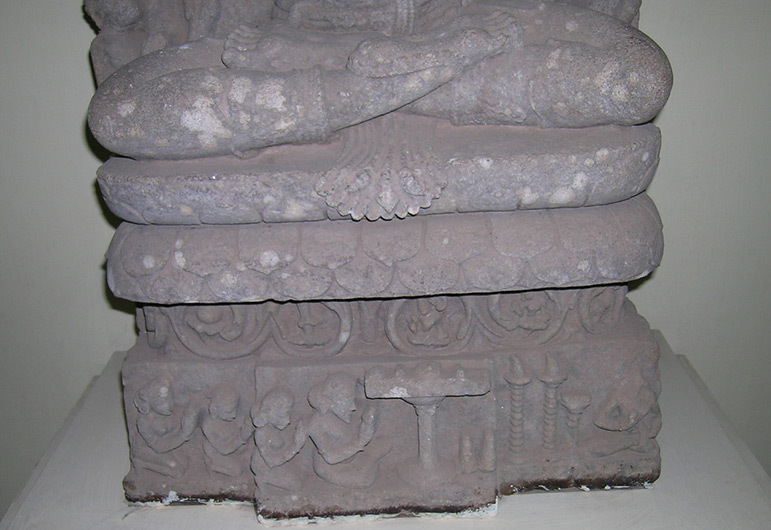 The preaching gesture and the two lotuses on either side (now damaged) are typical iconographic attributes of Prajnaparamita. In addition, it is important to note that the Buddha who sits right above her crown is Amitabha, instead of Amoghasidhi, the usual spiritual sire of Tara. Most importantly, the bottom register under the band of seven jewels contains a scene of a ritual, not any ritual but that of the worship of a book. The book in worship is most likely to be the Prajnaparamita sutra, the book of the Buddhist book-cult. We may compare this ritual scene with the scene showing a simple ritual of reciting a book by a monk depicted in the Mahamayuri panels of Ellora (fig.1.2 and web.1.1). The ritual depicted in the eleventh century stele of Prajnaparamita seems to be more elaborate and cultic, involving a ritual master and wealthy lay patrons. The book is clearly a prominent object of worship in this scene whereas the book in the Ellora panels is a small utility object that could be held in hand read.28 The composition of the stele makes the goddess the center of our attention just like Mahamayuri in Ellora. The goddess remained in worship until the twentieth century, albeit in a non-Buddhist context. Although considerably smaller in size than the goddess, the book and the goddess sustain parallel existence in this stele, one in the earthly realm and the other in the divine realm. In fact, her divine presence originates from the ritual recorded underneath, and the book in worship establishes her identity as the goddess Prajnaparamita. The juxtaposition between the book and the goddess as represented in this stele also demonstrates the book's potential as a manageable, portable sacred object unlike a stone image that would have been installed in one spot and remained more or less immovable. The stele clearly represents the increased cultic status of a Buddhist book. The text suddenly drops the mode of listing contradictory pairs of counter-statements as a way to show the idea of sunyata (emptiness or void-ness) and becomes affirmative about stating the methods of worshipping the book physically and the merit one acquires from such actions.31 Having a book means that one has a physical, palpable container for the profound Buddhist philosophy. If entirely formless, the propagation of the doctrine of emptiness would not have been as effective as it proved in its long history of immense popularity. As a text that is not too user-friendly with complex concepts expounded, extoling the merit of its multiplication and proliferation through production and cultic use seems to have been a wise strategy for its survival. 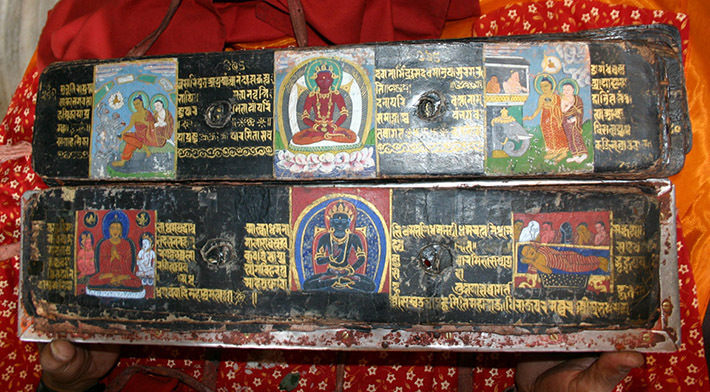 The AsP dictates the worship of the book in a concrete manner: a book of the Prajnaparamita sutra is to be worshiped with numerous material objects such as "flowers, incense, scents, wreaths, unguents, aromatic powders, strips of cloth, parasols, banners, bells, flags and rows of lamps." It is difficult to prove, however, how much of what is prescribed in the AsP was in fact practiced during the early centuries of the Common Era. Faxian's report and the monks with books at Ellora suggest cultic use of Buddhist books but the ritual was rather simple. In practice, the full potential of a book as a cultic object as described in the AsP text was realized after the ninth century although the AsP text signals the early date of the Mahayana Buddhist book-cult as an idea, as Schopen suggests. With the renewed interest in the Prajnaparamita literature from the ninth century onwards in Pala India as explained above, the cultic aspect of the AsP seems to have been reemphasized. An explosion of the production of the illustrated Buddhist manuscripts in the eleventh century, a considerably late date for the Prajnaparamita cult, supposedly in practice almost for a millennium by that time, may be a culmination of this post ninth-century development. 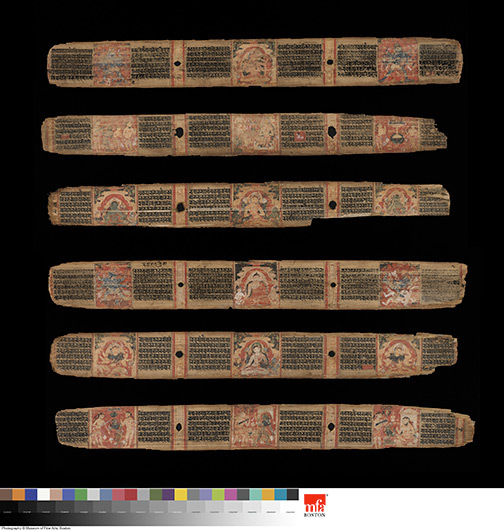 In addition, the Manjusrimulakalpa, a ritual text of the eighth century or later, seems to have provided an inspiration for designing the Buddhist books as sacred objects. 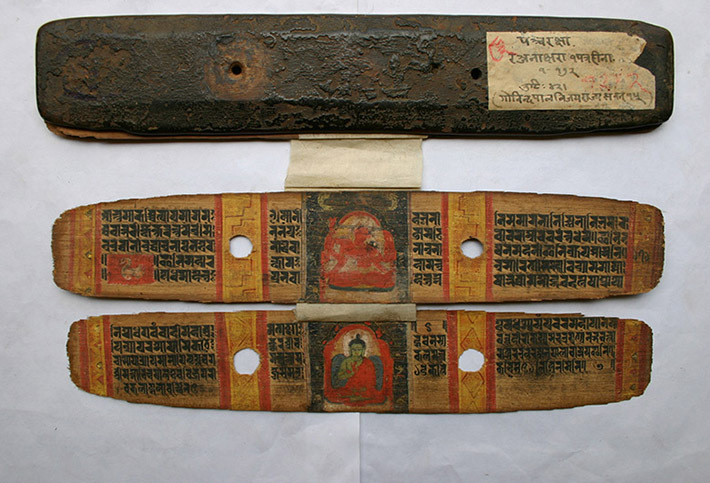 Another piece of the puzzle that could help us locate this later boom of the Buddhist book-cult in practice in the historical context is the development of the cult of relics, especially of the "dharma relics" during the early medieval period. 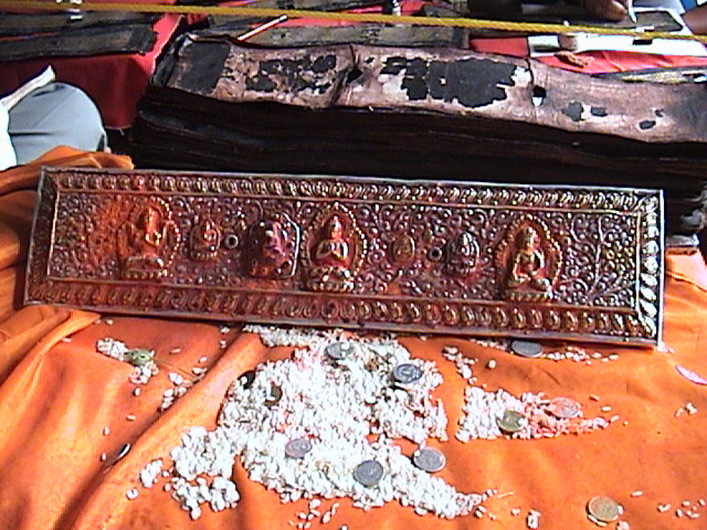 The early medieval development of the cult of the dharma relics in which the Buddha's teaching, epitomized in one single verse of the Pratityasamutpadagatha, is deposited as relics inside stupas and images, is understood as an important product of a synthesis between the stupa (Buddhist relic mound) cult and the book cult.32 The Mahayana book-cult as explained in the early Mahayana texts made the Buddha's teaching materially and practically venerable, and contributed to the emergence of the cult of the dharma relics which in a way revolutionized the Buddhist practices with Buddha's true relics readily available for anyone who desired to get one. The cult of the dharma relics opened up the door to everyone for ready access to the Buddha's true relics, and perhaps it is a truly Mahayana intervention. 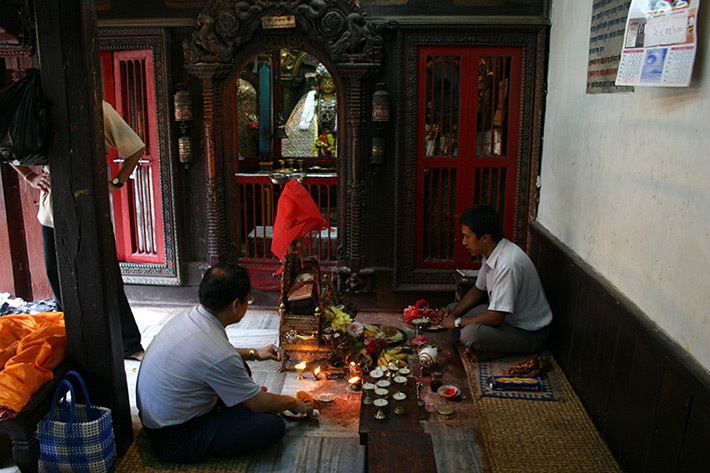 The fundamental similarity between the Buddhist book-cult and the cult of the dharma relics, relying on the materiality of the text as an embodiment of the Buddha, may obscure any distinction between the two cultic practices.33 It is easy to assume that the Buddhist book-cult, supposedly early Mahayana cult, was subsumed under the cult of the dharma relics that developed after the sixth century.34 However, in practice, this was not necessarily the case. The linear developmental model of the Mahayana cultic practices stems partly from understanding the Buddhist book-cult as an early Mahayana institutional response to the stupa cult, the oldest Buddhist cultic practice.35 In juxtaposing the Buddhist book-cult and the stupa cult, we implicitly acknowledge that the Buddhist books functioned as relics that sanctified the space where they were placed. 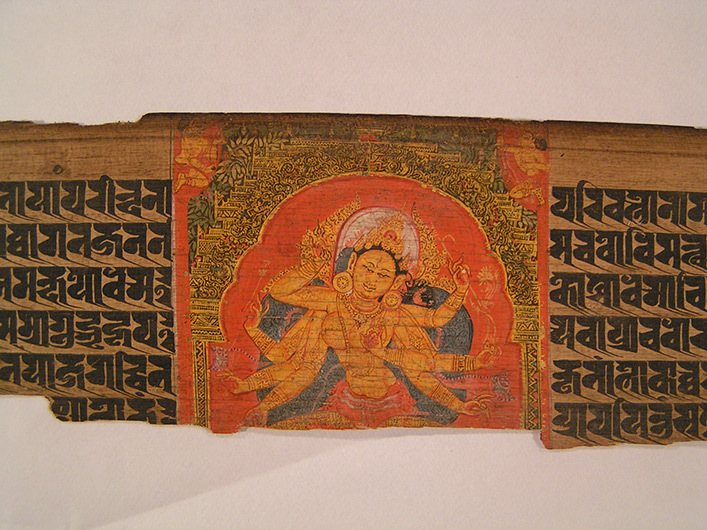 However, Buddhist manuscripts were rarely deposited as relics in South Asia. There is very weak archaeological support for the practice of depositing manuscripts in stupas in early South Asia.36 The archaeological and art historical evidence for the booming of the book-cult in practice appears around the turn of the first millennium, in the form of lavishly illustrated manuscripts and the representations of a book in worship in stone steles and manuscript paintings (web.1.2, fig.6.4). Passages explaining the theological and practical grounds of the book-cult in the AsP, in fact, argue that a book is an object of worship in its own right, just like a stupa. More importantly, Buddhist manuscripts from medieval South Asia have the dharma relic at the ends of their texts before the donor colophons. Whether it is a doctrinal text like the AsP or an apotropaic text like the Pancaraka sutra, this dharma verse appears in the same manner regardless of their doctrinal affiliations. In fact, this verse is found not only in illustrated manuscripts of the Mahayana sutra-s, but also in non-illustrated manuscripts of various Buddhist texts, including tantras, such as the Heruka Tantra37, the Abhidhanottara38 and the Guhyasamaja39, and ritual manuals, such as the Sadhanasamuccaya40. If the Buddha's teaching contained in any of these manuscripts is to be understood as the Buddha's dharma body, it seems rather redundant to have this dharma verse added at the end of each manuscript. 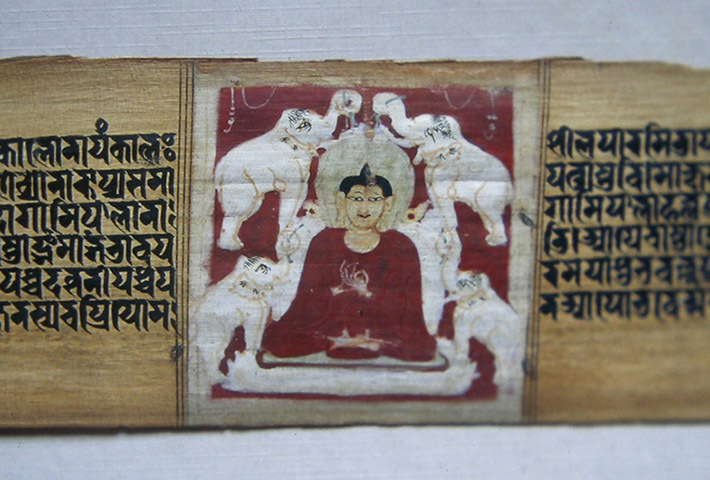 The inclusion of the dharma relic in Buddhist book production seems to affirm a book's status as a physical container of the Buddha's true relic, i.e., his teaching. Its presence ultimately contributes to a book's qualification as a Buddhist cultic object par excellence. The rigorous use of the dharma verse in manuscript production also affirms a book's cultic status as a physical container of a complete unit of the Buddha's teaching. 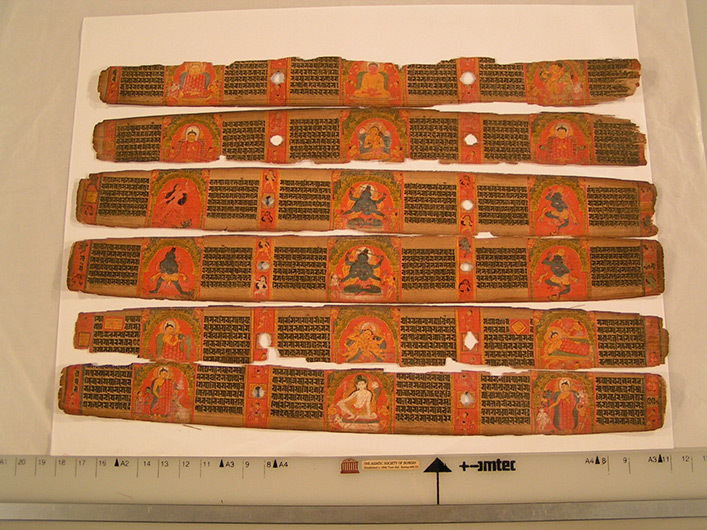 Perhaps with the advent of so many different types of text relics, such as seals and slabs with the dharma verse and other dharais, the status of a Buddhist manuscript was in need of reconfirmation as an object of worship by itself. 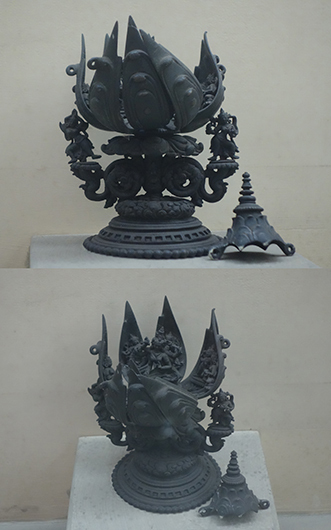 Adopting the ways of using the dharma relics in the production of sacred objects such as images and stupas, could have been a good strategy to this end. While the seals and the slabs with the dharma verse on them were frequently deposited inside a stupa and sometimes in an image, the illustrated Buddhist manuscripts from medieval India and Nepal were rarely put inside a stupa. They remained in the custody of monastic communities and of families if they were non-monastic productions, often serving as cultic foci. As we will see at the end of this study, a thirteenth century manuscript of the AsP has survived in worship until today partly thanks to the hidden and not-so-hidden signs of piety that have been accumulated on the body of a manuscript. 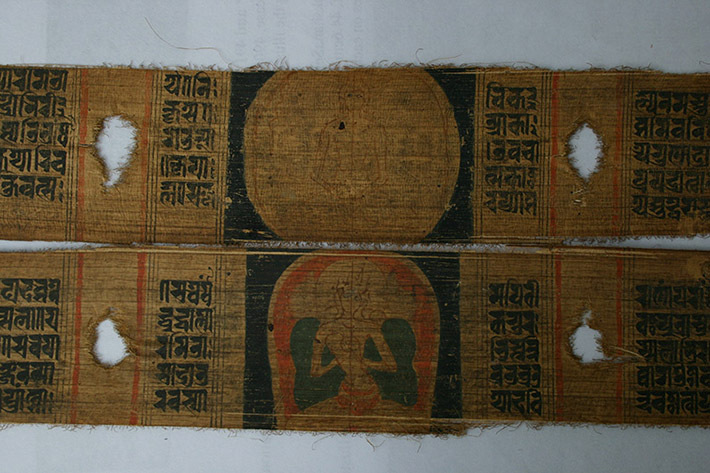 These ample signs of piety contributed to the survival of the Buddhist book cult in South Asia. In the context of South Asian Buddhist book-cult, a book consistently tries to retain its identity as an object of worship while its production and cult are modeled after those of stupas and images. Perhaps, there was a concern for losing its cultic status and slipping into the realm of the dharma relics since the Buddhist book-cult and the cult of the dharma relic are quite similar in terms of acknowledging the importance of the materiality of the text. In fact, the fusion of the two did happen and Buddhist books did slip into the realm of relics, as seen in the Tibetan practice of depositing manuscripts inside stupas and images.42 The tradition of the Buddhist book cult, however, did not disappear. It survives today in Nepal in the Golden Temple with the worship of a 13th century Prajnaparamita manuscript. I think the cult's survival attests to the cultic power a book. Although I draw a parallel comparison between the dharma relic-donor colophon formula in a manuscript and the dharma relic-donor inscription sequence on an image, a book occupies a special place in the sphere of Buddhist cultic objects. In terms of its cultic potential, a book may be even more powerful than any other cultic object for it embodies the paradox of the absent presence through the interplay between the visibility and the invisibility of that presence. It is important to remember that a book as an object presents a very dynamic spatial structure in regards to the definition of inside and outside. As a material object, a book is a collection of many movable parts, i.e., palm-leaf folios, which can be flipped and turned. There is a sense of inside and outside, but the sense of space in a book is more fluid and flexible than in a stupa or in an image. It is not as confined. One could open a book and leave the first two pages open during a ritual. 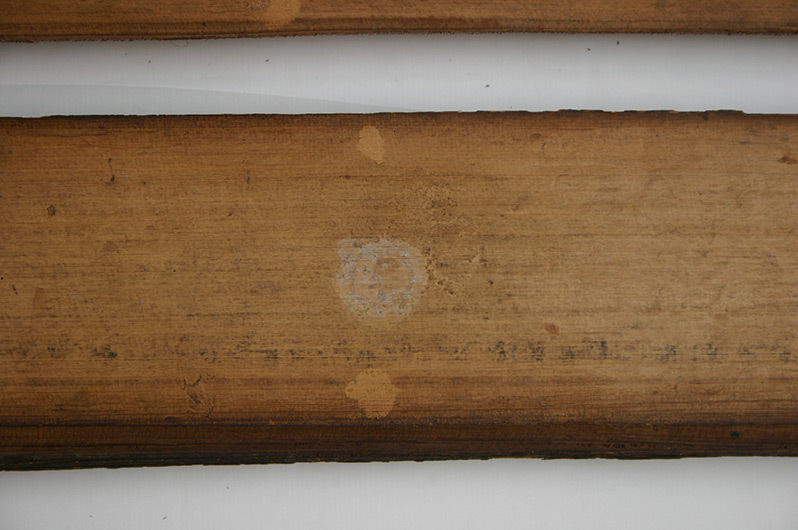 Many traces of worship, such as drops of sandalwood paste and red vermillion paste, on the first two folios of many illustrated manuscripts suggest this. When a book is open to its last pages at the conclusion of a ritual, the dharma verse and the donor colophon are as visible as on an image with inscribed dharma relics. 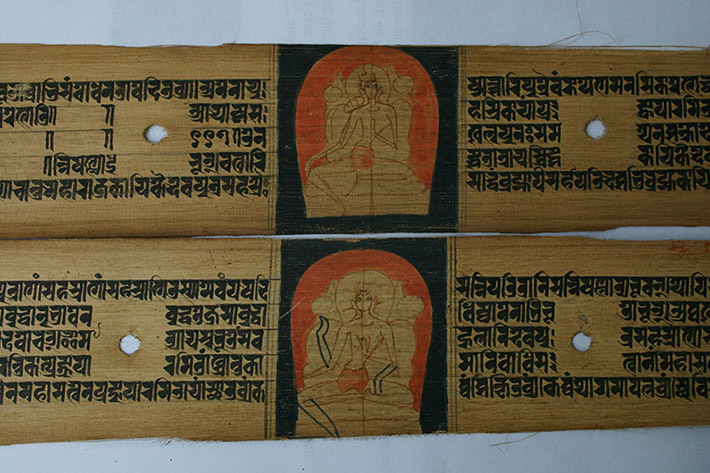 When a book is closed and put on a pedestal for worship as represented in many steles and slabs surviving from eastern India (fig.1.4, web.1.2), the dharma verse and the donor colophon are completely hidden from view, just like a hidden dharma seal on an image and relic deposits in a stupa.43 A book, then, is in itself a relic as a sacred text, and at the same time, it encases a true relic of the Buddha, his teachings written in beautiful letters. In other words, a book could be a relic and a reliquary simultaneously. Although drawing heavily on other cultic trends of the time, especially the relic cult, the Buddhist book cult found its niche for patronage in medieval eastern India, thanks partly to its multilayered cultic potential. The realization of the innate spatial fluidity of its three dimensional structure, perhaps similar to the ideas on space and time expressed in the Manjusrimulakalpa, seems to have contributed to a book's elevated status as the cultic object par excellence of the time. As we will see in subsequent chapters, the iconographic programs in the illustrated Buddhist manuscripts are often designed to emphasize the three-dimensional nature of a book as an object, and they help transform a manuscript into a physical container of the Buddha's dharma body. 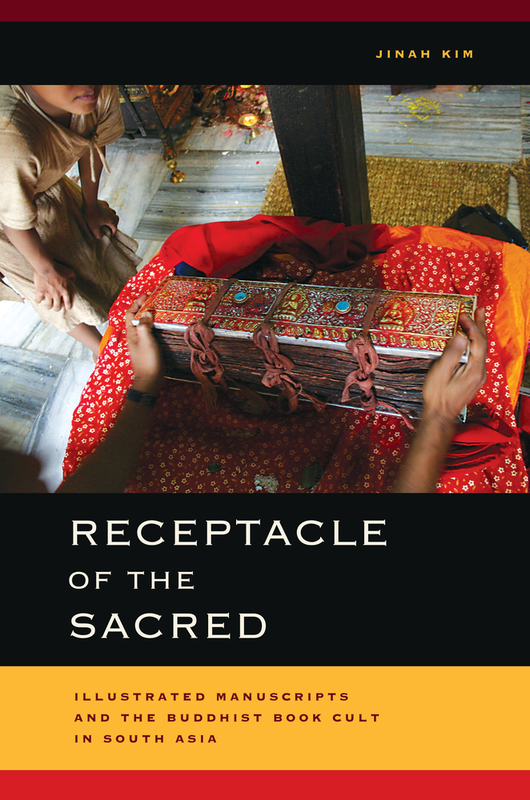 In considering medieval illustrated Buddhist manuscripts as sacred objects of cultic innovation, Receptacle of the Sacred explores how and why the South Asian Buddhist book-cult has survived for almost two millennia to the present. A book “manuscript” should be understood as a form of sacred space: a temple in microcosm, not only imbued with divine presence but also layered with the memories of many generations of users. Jinah Kim argues that illustrating a manuscript with Buddhist imagery not only empowered it as a three-dimensional sacred object, but also made it a suitable tool for the spiritual transformation of medieval Indian practitioners. Through a detailed historical analysis of Sanskrit colophons on patronage, production, and use of illustrated manuscripts, she suggests that while Buddhism’s disappearance in eastern India was a slow and gradual process, the Buddhist book-cult played an important role in sustaining its identity. In addition, by examining the physical traces left by later Nepalese users and the contemporary ritual use of the book in Nepal, Kim shows how human agency was critical in perpetuating and intensifying the potency of a manuscript as a sacred object throughout time. Jinah Kim is Assistant Professor of History of Art & Architecture at Harvard University. 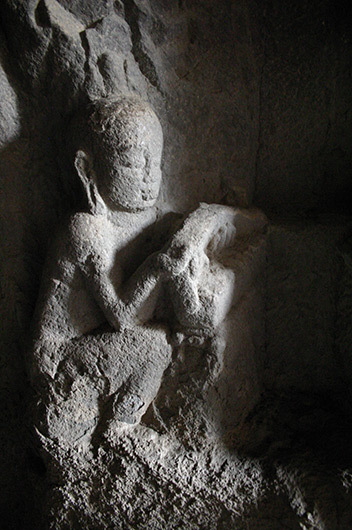 Web 1-1 Monk holding a book, detail of the Mahāmāyūrī panel, Cave 10, Ellora, ca. 7th century. Web 1-2 Scene depicting a pustaka pūjā (worship of a book), detail of the Prajñāpāramitā stele, Mangalpur, Orissa, ca. 11th century. Orissa State Museum. Web 2-1 Folio 1v–folio 2r, AsP Ms (Ms A1), Mahīpāla’s 6th year (ca. 983 CE), Nālandā monastery, Asiatic Society, Kolkata, G.4713. Web 2-2 “Prayer wheel” outside the entrance to the main temple, Wanla monastery, Ladakh, ca. 19th–20th century(?). Web 2-3 Sculpted cover of an AsP Ms in worship during restoration of the manuscript, Patan, Nepal. July 19, 2004. Web 2-4 Vajra Tārā lotus maṇḍala, Chandipur near Pātharghāta in Bhagalpur district, Bihar, ca. 12th century. Bronze. Indian Museum, Kolkata. Web 3-1 Buddha’s life scenes, Tārā and Avalokiteśvara, folios 187v–188r, AsP Ms (Ms A6), ca. mid-11th century. © Wellcome Library (Sansk ε 1). Web 3-2 Mañjuśrī, folio 2r, AsP Ms (Ms A4), ca. 1140 CE, Nālandā. Asia Society, New York: Mr. and Mrs. John D. Rockefeller 3rd Acquisitions Fund, 1987.1. Image courtesy of Asia Society Museum. Web 3-3 Avalokiteśvara on Mt. Kuṭa in Gandhara (left) and Vajrapāṇi of Maṅgakoṣṭa in Oḍḍiyana, Swat valley (right), folio 89r, AsP Ms (Ms B1), 1015 CE. Cambridge University Library, Add. 1643. Image reproduced by kind permission of the Syndics of Cambridge University Library. Web 3-4 Tārā of Vaiśālī in Tīrabhukti, left panel, folio 157v, AsP Ms (Ms B1), 1015 CE, Cambridge University Library, Add. 1643. Image reproduced by kind permission of the Syndics of Cambridge University Library. Web 3-5 Tārā in Potalaka (caption: potalake-bhagavatītārā), folio 113r, AsP Ms (Ms B2), ca. 1071 CE (NS 191), Asiatic Society, Kolkata, A.15. Web 3-6 Sitātapatra (caption: sitātapatrabhaṭṭārakaḥ), folio 168r, AsP Ms (Ms B2), ca. 1071 CE (NS 191), Asiatic Society, Kolkata, A.15. Web 3-7 Twelve-armed Avalokiteśvara (Lokanātha of Tulakṣetra in Varendra? ), folio 267v, Pañcaviṃśatī Prajñāpāramitā (PvP) sūtra Ms (Ms B3), ca. 1100 CE (Harivarman’s 8th year). Baroda Picture Gallery and Museum. Web 3-8 Buddha worshipped by four elephants (Gandhavatī Kalasavarapura? ), folio 368r, PvP Ms (Ms B3), ca. 1100 CE. Baroda Picture Gallery and Museum. Web 4-1 White dot with a vague sign of a letter on the reverse side of Mahāmāyūrī panel, folio 88r, Pañcarakṣā Ms (Ms C2), dated 1135 CE. Edwin Binney 3rd Collection. The San Diego Museum of Art, 1990.156 (http://www.SDMArt.org). Web 4-2 Bodhisattva Dharmodgata preaching the Prajñāpāramitā (top, folio 295v), Sadāprarudita and merchant’s daughter paying homage to the Prajñāpāramitā (bottom, folio 296r), AsP Ms (Ms C3), ca. 1148 CE. Asiatic Society, Kolkata, G.4203. Web 4-3 Mahāśītavatī and Amoghasiddhi, folios 70v–71r, Pañcarakṣā Ms (Ms C6), Govindapāla’s 16th year (ca. 1191 CE). National Archive, Kathmandu Acc. No. 5.83. Web 4-4 Six bodhisattvas, folios 63v–64r, Pañcarakṣā Ms (Ms C5), Madanapāla’s 13th year (ca. 1156 CE). Museum Rietberg, Zurich, Gift of Fritz and Monika von Schulthess. Web 5-1 Folios 1v–2r, AsP Ms (Ms D3), Rāmapāla’s 36th year (ca. 1113 CE), Victoria and Albert Museum IS4.1958-IS5.1958. © Victoria and Albert Museum, London. Web 5-2 Illustrated folios (from top to bottom: 95r, 206r, 1v, 94v, 2r, 205v), AsP Ms (Ms D4), ca. 1136 CE, Museum of Fine Arts, Boston, Acc. 20.589. Photograph © 2013 Museum of Fine Arts, Boston. Web 5-3 Virupa, central Tibet (Sakya monastery), consecrated by Sakya Paṇḍita (ca. 1182–1251 CE), the Kronos Collection. Image Courtesy of Steven Kossak. Web 5-4 Illustrated folios (1v–2r, 107r–106v, 222r–221v; note that 107r–106v and 222r–221v are switched in their order. ), AsP Ms (Ms D9), Govindapāla’s 32nd year (ca. 1207 CE), Asiatic Society, Mumbai, Acc. No. I-210. 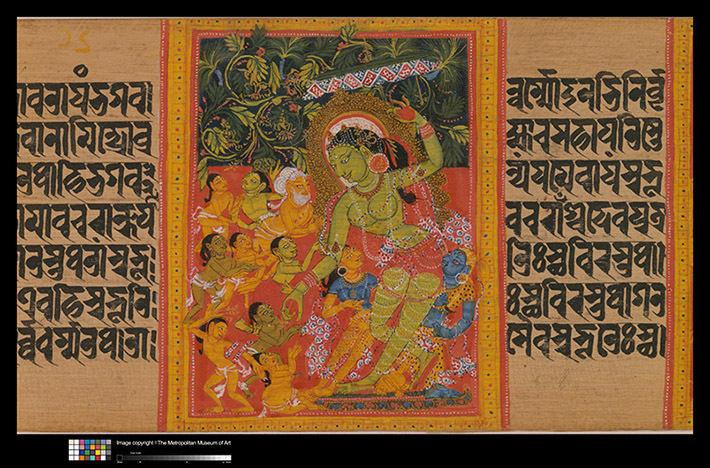 Web 5-5 Vajra-Tārā, folio 222r, center panel, AsP Ms (Ms D9), Govindapāla’s 32nd year (ca. 1207 CE), Asiatic Society, Mumbai, Acc. No. I-210. Web 5-6 Folios 1v–2r, AsP Ms (Ms D10), Lakṣmaṇasena’s 47th year (ca. 1226 CE), Bharat Kala Bhavan, Banaras Hindu University (BHU), Varanasi. Web 5-8 Sambara, folio 141v, center panel, AsP Ms (Ms D10), Lakṣmaṇasena’s 47th year (ca. 1226 CE), Bharat Kala Bhavan, BHU, Varanasi. Web 5-9 Last two folios, AsP Ms (Ms D10), Lakṣmaṇasena’s 47th year (ca. 1226 CE), Bharat Kala Bhavan, BHU, Varanasi. Web 6-1 Jewel-giving (Cintāmaṇi) Avalokiteśvara with devotees, folio 139v, AsP Ms, late 12th century. The Metropolitan Museum of Art, 2001.445l. Image © The Metropolitan Museum of Art. Web 6-2 Jewel-giving (Cintāmaṇi) Tārā with devotees, folio 140r, AsP Ms, late 12th century. The Metropolitan Museum of Art, 2001.445i. Image © The Metropolitan Museum of Art. 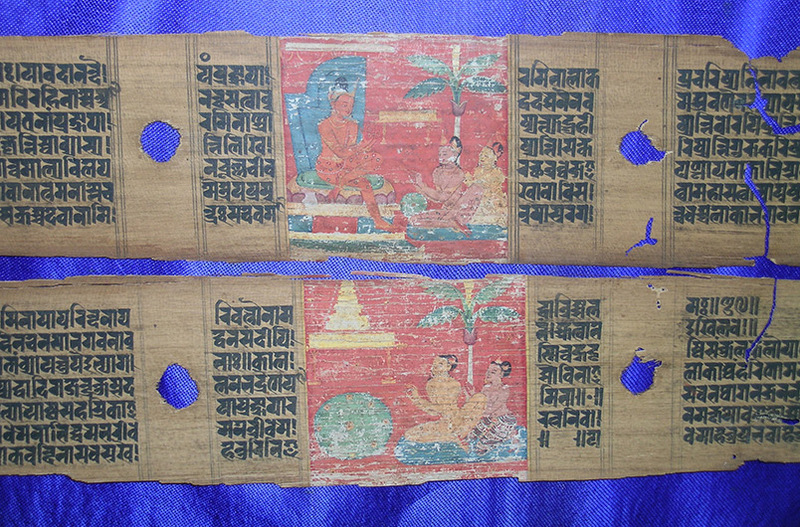 Web 6-3 Unfinished panels depicting Buddha (top) and Prajñāpāramitā (bottom), folios 1v–2r, AsP Ms, ca. late 12th century, Kaiser Library, Kathmandu, Acc. No. 9.102. 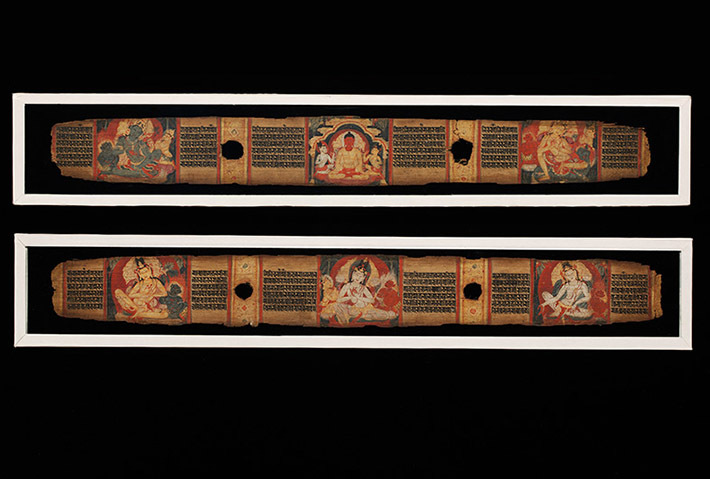 Web 6-4 Unfinished panels depicting bodhisattvas, folios 29v–30r, AsP Ms, ca. late 12th century, Kaiser Library, Kathmandu, Acc. No. 9.102. Web 6-5 Sambara panel, last folio of an AsP Ms, prepared by ācārya Prajñābala, Govindapāla’s 18th year (ca. 1193 CE), Asiatic Society, Kolkata, G.9989A. Web 7-1 Paying homage to the book prior to the beginning of the ritual, Kwā Bāhā, Patan, Nepal, June 30, 2004. 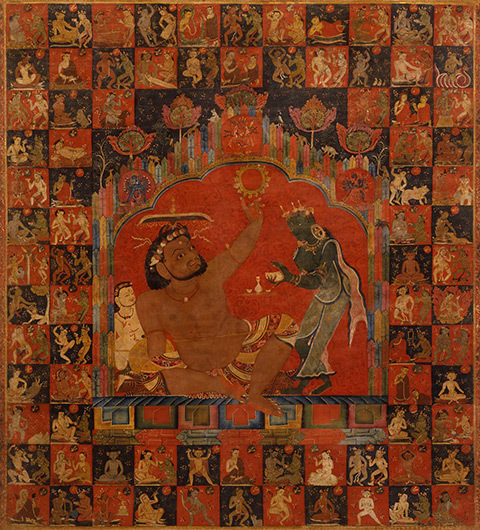 Web 7-2 Prajñāpāramitā pustaka pūjā: Main priest, Cakra Raj Bajracharya (Vajrācārya), Min Bahadur Shakya (patron, jajmān), and the book on its throne-like seat, Kwā Bāhā, Patan, Nepal, June 30, 2004. 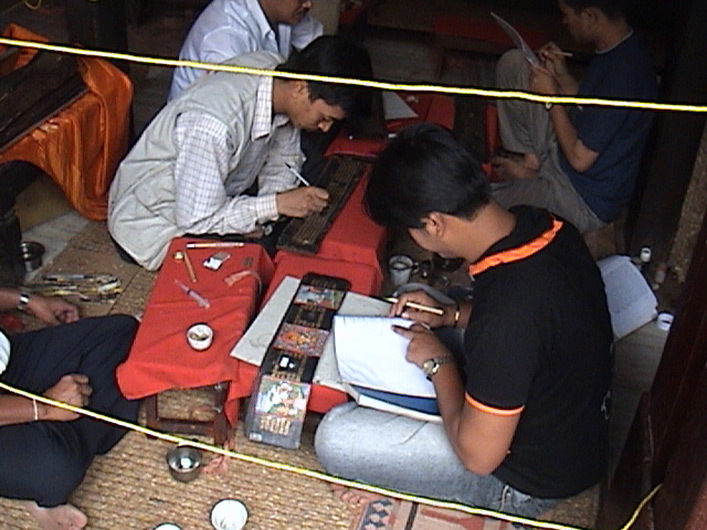 Web 7-3 Vajrācāryas gathered to restore the Prajñāpāramitā manuscript, Kwā Bāhā, Patan, Nepal, July 19, 2004. 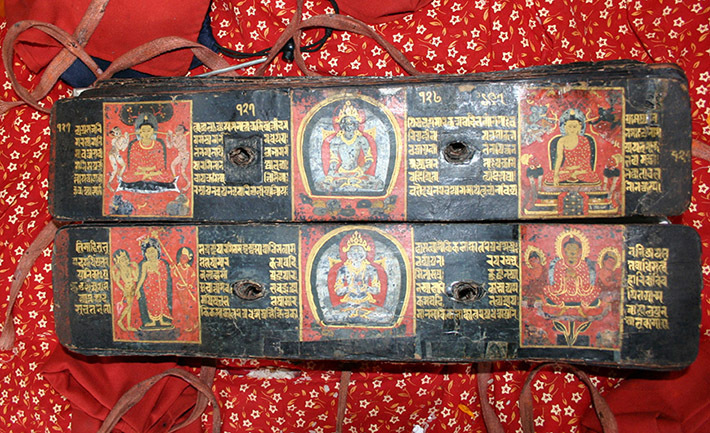 Web 7-4 Folios 127v–128r with original 13th-century painted panels, AsP Ms, NS 345 (1235 CE), Kwā Bāhā, Patan, Nepal. 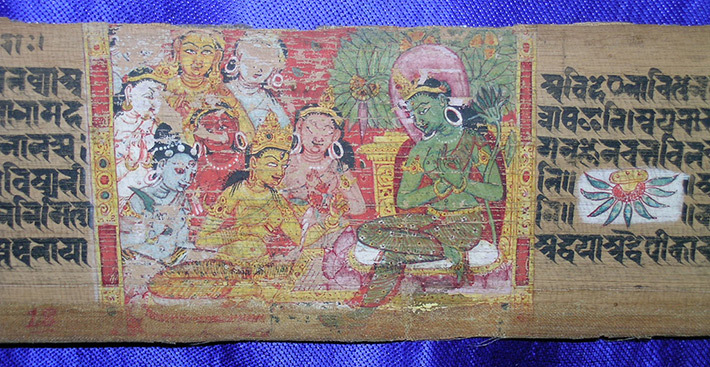 Web 7-5 Folios 296v–297r with painted panels restored during the 20th century, AsP Ms, NS 345 (1235 CE), Kwā Bāhā, Patan, Nepal. 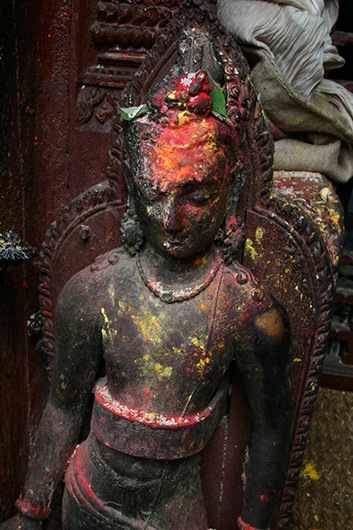 Web 7-6 Statue of bodhisattva Avalokiteśvara (9th or 10th century) with signs of worship, Kwā Bāhā, Patan, Nepal. Web 7-7 Front part of the lineage deity shrine in the center of the courtyard with sculptural and decorative additions from different times, Kwā Bāhā, Patan, Nepal. W-Diagram 2-1 Structure of an AsP manuscript (Group A). W-Diagram 3–1 Ms A4: AsP, Vigrahapāla III’s 15th year (ca. 1058 CE) and Gopāla IV’s 8th year (ca. 1140 CE), Asia Society, New York. W-Diagram 3–2 Ms A5: AsP, Mahīpāla’s 5th year (ca. 1074 CE), Cambridge University Library, Add. 1464. W-Diagram 3–3 Ms B1: AsP, prepared in NS 135 (1015 CE), restored in NS 259 (1139 CE), Cambridge University Library, Add. 1643. W-Diagram 4–1 Ms D1: Pañcarakṣā sūtra, Nayapāla’s 14th year (ca. 1042 CE), Cambridge University Library, Add. 1688. W-Diagram 5–1 Ms D7: AsP, Rāmapāla’s reign (ca. 1077–1130 CE, ca. 1130 CE or earlier), British Library, Or. 14282. W-Diagram 5–2 Ms D8: AsP, Govindapāla’s 32nd year (ca. 1207 CE), Musée Guimet, Paris, MA 5161, formerly Fournier Collection. W-Diagram 5–3 Ms D9: AsP, Govindapāla’s 32nd year (ca. 1207 CE), Asiatic Society, Mumbai, BI-210. W-Diagram 5–4 Ms D10: AsP, Lakṣmaṇasena’s 47th year (ca. 1226 CE), Bharat Kala Bhavan, Banaras Hindu University.